The market is dwimming with people, and the voices discuss everything from unfaithfulness to prices. The sun is at its highest, and so is the energy of the town people. 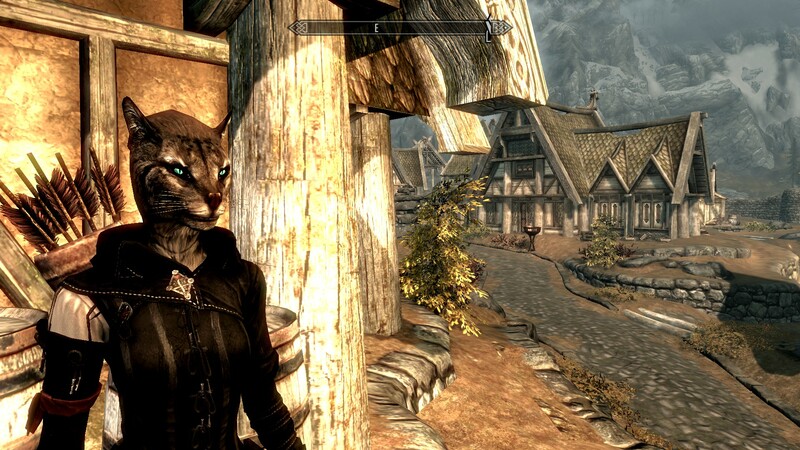 For all of them this was an ordinary day, but for this particular khajit this day would send her towards a new meeting. The sun lowers from its peak and time passes slowly. Neylla bites her lip in annoyment from having to wait for so long. But before she has time to consider leaving a hand is laid on her shoulder. She knows not to turn around, because the less she knows the more secure the person giving her the mission will feel. All Neylla cares for is the payment, whomever is paying doesn’t matter. From behind her she can hear fidgeting with a bag, and in a matter of second a parcel is placed in her paw. There is a low, male voice behind her and he whispers: “The mission is inside. I was told to say good luck. The payment will be given once the mission is over, if you survive.” This was something Neylla was accustomed too. No one seemed to know her skills but her, and she had no doubt this mission too would be easy. Only a few seconds passed before she could hear the footsteps from the person that had given her the parcel fade away. Once she was certain he was gone she walked out from the market and out of the town, to a little river nearby. She sat down by the riverside and listened to the flowing water and the calm wind that stroked her fur. For a moment she smirked thinking of how calm she was for a girl that just got an assassination mission. Neylla took her time, studying the grass, and the birds and the wildlife around her. The animals didn’t seem to mind her presence, as she was part animal herself. Neylla sighed and she took the parcel from the grass where she had put it, and she pulled open the ribbon that was keeping it shut. She rolled it out and read it to herself in a low voice. Reward is given once mission is accomplished. You know how to contact us. It was brief, just like the conversation with the one that had delivered this to her. She studied the handwriting of the letter. It seemed to be of a wealthy man. The writing wasn’t feminine, but it had a bold look to it. Neylla sighed. 80 000 gold coins wasn’t the largest reward she had claimed, but for a single head it wasn’t the worst price. For a moment Neylla imagined the horse she would be able to buy for such a price. It would be the fastest horse she had ever rode, and it could maybe even get her several large meals at the inns around the land. She licked her lips, and realized how thirsty she actually was. Her paw grabbed the leather covered bottle she had hung onto her belt and she opened the lid and took a large mouthful of the water. This was taken from one of the more pure rivers she had come across a few days ago, and she did not regret having stopped there. The water was so clean, and with such a taste that was rare to come across. She rose to her feet in a swift movement and she put the bottle back onto the belt. Above her the sun was shining brightly and she covered her eyes with her left paw. “I suppose I should look for clues, because sitting here won’t get me anywhere” she said to herself as she began pacing back to the town. At the entrance to the town she found a horse carriage operated by a friendly man. She paid him 20 gold coins and she jumped aboard. They were headed to a bigger city, with more opportunities for finding the target. As the carriage swayed with the hooves of the horse Neylla sharpened her daggers and claws. The man driving the carriage turned and looked at her “You preparing for a war or somethin’ gal?” he asked. For a second Neylla considered her answer “Isn’t being prepared always a good thing?”. The man shrugged and turned back to watching the road. Throughout her journeys Neylla had learnt that picking ones words with care was a good trait, especially in the assassination business, after all, she did not want to be recognised. And if she did, well, then there would be more bloodshed to keep the silence permanent. It did not take long until the horse drawn carriage stood at the gates to the city. The guards scanned the carriage with their eyes and after trying to figure out who Neylla was they gave up and let the carriage through. It had taken quite a while, the guards tried to question her in every way they could think of, but she avoided every question with clever lines that the guards did not want to admit they did not understand. Eventually the man which seemed to be the leader of them sighed and waved the carriage through. Neylla couldn’t help but giggle a bit, but she kept it low to not show her more subtle side. The guards slowly pushed the gates open. From seeing their strained faces Neylla guessed the gate was rather heavy too. The gate was made out of thick, dark wood and when the carriage was up close she could clearly see holes in it indicating people trying to get through. Several of the holes seemed to have been from arrows, whilst there were some cuts made by sword. For a spare second Neylla considered how she would get through them if she had too, but she quickly figured that trying to get through the gate was the lesser wise choice. Within the gate and the walls of the city she saw a large number of people of all races, some lizards, some human.. Most races were represented, but the humans seemed to have the numbers. There were several tall buildings around the centre of town, and Neylla thought back to her younger days when she used to climb the houses around her own hometown. She smiled slightly at the thought as she observed the children running around playing. When the carriage came to a stop Neylla bowed her head to the friendly man that had driven it, and then she proceeded into town. In her pocket she had a little list of a few things she would need for the journey as she didn’t know how long this mission would take. Luckily she still had some of the gold coins from her prior mission, and that would get her more than enough. But she kept her coins well hidden, because she did not want to give anyone any indication that she did have what she needed, after all, that would give her unwanted attention. Neylla’s first stop was the general store. The shop was quite rundown, but it had everything she was seeking so she didn’t mind. The shopkeeper was a friendly man that seemed to be rather old. “What are you seeking today, young lady?” he asked in a cheerful voice. “Some simple travelling food should be sufficent” Neylla replied as she looked around the shop. “Yes, only a moment.” He said as he began to look through some of his shelves. After about a minute an older lady came out of one of the halls leading to that which seemed to be the rest of their house. “Tyrion, I can’t seem to open kitchen cabinet” she said in a calm voice. The man nodded to her and disappeared for a while. It took a few minutes before the man returned, and he seemed a little embarrassed. “Young lady, would you mind helping us with this cabinet? We can’t seem to get it open, and you seem like a person that might be able to help us.” Neylla smiled a bit and nodded to him. “I suppose” she said. She followed him into the other room, a very small kitchen, probably only fitting for a single person. At ground level Neylla could see the older woman kneeling by a cabinet, trying to pull it open. The old man pointed to the cabinet and gave Neylla a crooked smile. In a easy movement she knelt down by the woman and the woman moved. For a moment Neylla inspected the cabinet and it’s functionality before she with ease used one of her claws to open it. It seemed to be the easiest of tasks for her and the elderly couple looked in amazement as the cabinet doors opened. “Now, can I buy those goods?” Neylla asked. The doors to the general store opened and out came Neylla holding several breads and vegetables. She packed everything into her bag and she moved on to gather the rest of her list. After a few hours Neylla was finally finished with her shopping and she paced around town until she eventually went out the gate again. From the gate she headed toward a little stable she had seen from the road. When she came to the stable she seeked out the owner and told him that she wanted a horse. They both headed into the horse stables and Neylla began inspecting the horses. “I want the fastest horse you have, and it needs to have stamina”. “Now, now young lad. Are you sure you can afford it?” the owner asked and Neylla just smiled. “Tell me the price” she said to him not worrying for a second. “14 000 gold coins” he said to her, and as soon as he had said the number she pulled out her coin purse and handed him the amount he wanted. The transaction was quick, and Neylla took the horse by its reins and walked over to the road. She sat up on the horse and she simply swung her legs on the horse making it trot. “Time to get on the road and find this S’aron”. A written commission for Labbiss.